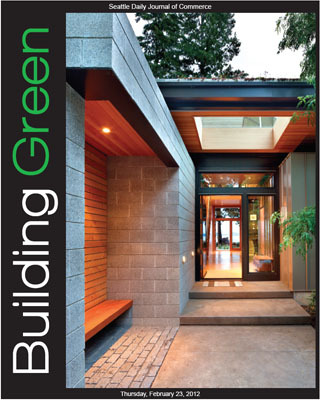 "Does a green retrofit make sense for your building?" "'Living streets' aren't just for drivers"
"How we earned LEED platinum without blowing our budget"
"'Living buildings': What we've learned so far"
"Which green certification program is right for you?" "City expands its goals for green with 2030 District"
"Live, work and farm at Ballard's Greenfire"
"Putting power-hungry data centers on a diet"
"Workers prefer their office makeovers green"
"LEED platinum house: green from start to finish"
"Your projects can still be green, even if LEED doesn't fit"
In 2009, Rice Fergus Miller purchased a derelict 30,000-square-foot former Sears Automotive Center in downtown Bremerton. Two years and nearly $3.15 million in construction costs later, the renovated commercial building is "deep green" with an energy use index of only 21 -- making it the most energy-efficient building in the Pacific Northwest by nearly 50 percent. Joanne and Ed Ellis wanted to create a home that was modern, educational and sustainable. Perched high on a Bainbridge Island bluff, their home was among the first LEED platinum residences to be built in Washington state outside Seattle. 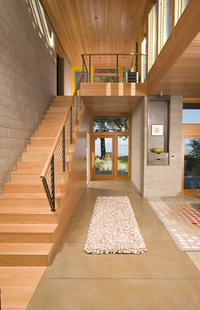 The Ellis residence on Bainbridge Island, completed in 2009, was among the first LEED platinum homes in Washington to be built outside Seattle. Coates Design was the architect and Smallwood Design and Construction was the general contractor.